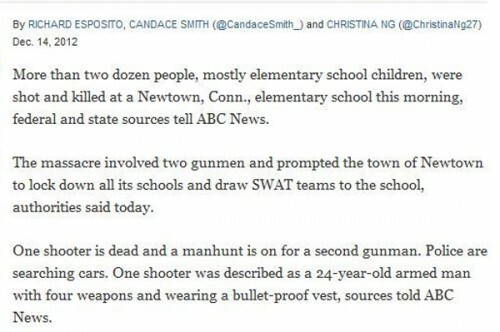 Two days ago, onDecember 14, 2012, another ‘withdrawn’, ‘troubled’, ‘genius nerd’ allegedly went on a rampage in the USA, killing dozens of people – this time, mostly small children at the Sandy Hook Elementary School in Newtown, Connecticut. The US government wasted no time in making subtle allusions to ‘gun control’: “We’re going to have to come together and take meaningful action to prevent more tragedies like this, regardless of the politics.” said Obama in the wake of the massacre. Statements such as these threaten to give America’s millions of 2nd amendment nut-jobs a collective aneurism. 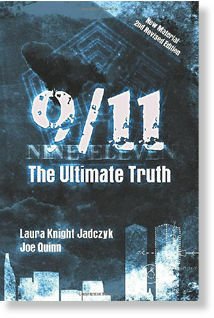 Throughout the wide and emotionally-charged media coverage, no one seems to care that there are many serious unanswered questions about the last major US domestic massacre, allegedly by another ‘withdrawn’, ‘troubled’, ‘genius nerd’ – James Holmes – in July 2012 in an Aurora, Colorado movie theater. Starring the Aurora Police Chief and a smirking FBI special agent, the following 3 minute video poses some uncomfortable questions that take us beyond the ‘lone nut and a nation in grief’ storyline that gets dragged out to placate the population every time someone goes postal in the USA. Yacone was a natural choice for this position given his background. He served eight years in the U.S. Army and is “a decorated combat veteran”. Specifically, he was directly involved in the massive US-inspired blood-bath that was the 1993 ‘Battle of Mogadishu’ that inspired the propaganda book and movie ‘Black Hawk Down’. stigations around the world in support of the global fight against terrorism. 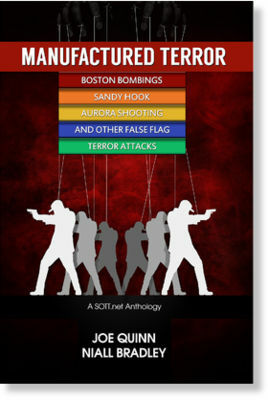 Ultimately, whether the cause is mind programmed patsies or just the ‘natural’ result of a very sick society, the result of these all-too-common US domestic massacres is to make everyone afraid of everyone else as a potential “domestic terrorist”. 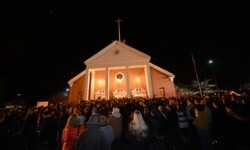 Just as there were eyewitness reports of a second person involved in the Aurora theater shooting, three or more gunmen involved in the ‘lone nut’ 2009 Fort Worth shoot-out, and four shooters reported in the Wisconsin Sikh temple ‘lone nut’ shooting, there have been several reports of at least two shooters in the Connecticut massacre. 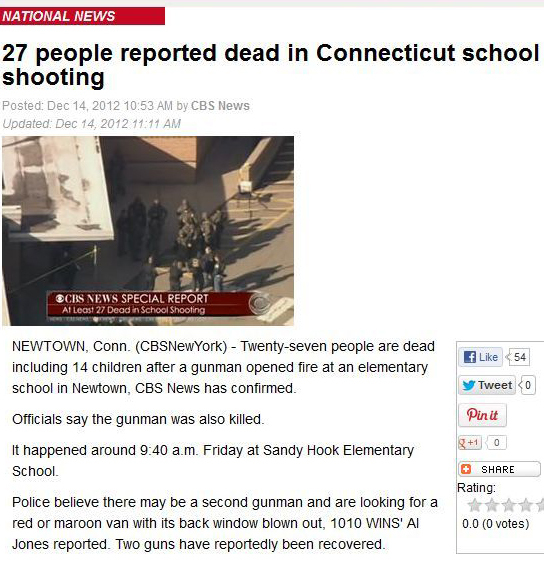 The ABC News report about a manhunt underway for the second gunman, BEFORE they got their story straight. Remember that the first shooter was supposedly very much dead by the time police arrived, so this second gunman could not possibly have been ‘confused’ for the other one. Multiple eyewitness testimonies confirm that this second man was handcuffed and taken to a police cruiser. We’re being told that the other shooter is Adam Lanza, who may or may not have killed his mother on his way to Sandy Hook, his old elementary school. This shooter was “masked” so there is as yet no evidence placing the 20-year-old at the scene. The police also told the press they were “looking for a red or maroon van with its back window blown out“, which again suggests that there was more than one perpetrator. Which obviously makes no sense at all, so today the lone gunman’s armory was increased to seven guns. The average southern Connecticut police response time is two to three minutes, so we’re being asked to believe that during that brief time interval an “autistic” 20-year-old fired off “at least 100 rounds” with two handguns, killing 28 people. Lt. Paul Vance of Connecticut State Police actually said that his officers “arrived instantaneously, immediately entered the school, searched it completely and found Lanza dead,” meaning that whoever carried out this operation had very little time indeed. In the meantime, the media has brought gun control to the top of the U.S. agenda. Certainly, gun control could be a side issue here, but there have been literally dozens of such shootings in the USA over the past 25 years, and yet laws controlling the availability and use of guns were never passed. On the contrary, shooting sprees by alleged ‘lone nuts’ have historically caused gun purchases to increase in the USA. If there is an agenda at work here, then it seems that it may involve creating a situation where a large percentage of U.S. citizens are armed to the teeth, and then, and ONLY then, will the government try to take those arms away, sure in the knowledge that a decent number of those armed citizens will resist, with predictable consequences. Theorizing aside; it is profoundly disturbing for anyone (with a conscience) to have to consider those 20 little kids being cut down in this way just a couple of weeks before Christmas. A few minutes before their murderer(s) forced his or their way into their school, those 20 children were all undoubtedly in that state of anticipation that kids experience at the approach of the holidays. But now, not only will they never see their holidays, their families have been destroyed too. This event is a huge, evil black mark on our ‘modern’ society that derives all of its ‘morality’ from the nihilistic mindset of the psychopath; more than that, it is an attractor for doom that is now added to the already long list of black marks against the psychopaths of this era and the ponerized societies they have spawned. Thanks to Niall Bradley and Laura Knight-Jadczyk for their extensive input on this article. Everything seems to be about camouflage these days. It's a growing movement so I started a camouflage blog yes I did it's http://camouflage1.com y'all come by and visit please. ARE YOU A HEALTHY MALE OR FEMALE BETWEEN THE AGES OF 18-55? Be compensated up to $8800 .00 for participation in the study.